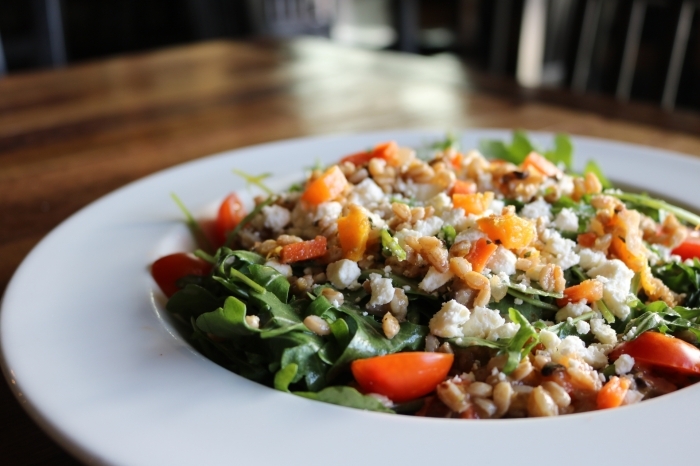 Farro is hailed as the next “super grain” and our Farro Salad is always a big hit. The recipe as well as our charred lemon vinaigrette is below! Toast the farro on a baking sheet for 5-10 minutes in a 350 degree oven (should be lightly browned and smell toasty). Transfer to a medium sauce pan, add 2 cup water and cover, simmer for 10 to 15 minutes until all water is absorbed. Transfer to baking sheet and chill. Roast each vegetable separately. For the onion, slice them into rounds, oil and roast, then dice. For the mushroom, remove the stem and gills, oil and roast, then dice. For the butternut squash, peel and slice into slabs, oil and roast, then dice, same for the carrots. Once all components are cooled simply toss all in a large mixing bowl and taste for salt. This should be made at least two hours before service to allow all the flavors to settle in to a nice balance. You can make it a day in advance and that’s even better. (makes about 5 cups of dressing but what you don’t use for this recipe you can keep refrigerated at least a week). To make the charred lemon juice, halve the lemons and grill cut side down until caramelized (a hot sauté pan will work if you don’t have a grill). Then juice the lemons. The amount of juice per lemon varies greatly so make the measurement after juicing (it usually it takes between 2-4 lemons). Combine all ingredients except the oil in a blender/food processor and slowly add the oil while the blender is running to emulsify the dressing. Toss farro salad mix, baby arugula and lemon vinaigrette in a mixing bowl and plate, pulling the arugula out first and resting most of the farro mix on the bed of arugula. Almost finished, simply top with the feta cheese and arrange the cherry tomatoes artfully around the salad. Now serve and enjoy.